Overlap Shed This Overlap Shed is one of our own Overlap Shed range. This Overlap Shed made in the UK. The Billyoh Budget Overlap Shed Apex has traditional overlap cladding. The BillyOh Budget Overlap Apex is a windowless design for added security, no more prying eyes. Full fixing kit including felt and instructions are included. These Overlap Sheds the door is located on the 6ft gable end for each overlap sheds . 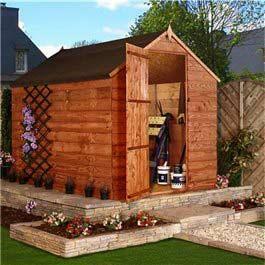 The BillyOh Lincoln Tongue and Groove Apex Wooden Shed comes complete with fixed side windows that allow a generous amount of light that is needed for any Work-Shed , also floor joists to give extra strength for a work bench or storing heavier items and it’s main feature that is the double doors allowing extra convenience when accessing the Wooden Apex Tongue and Groove Garden Shed . Comprehensive assembly instructions, fixing kit and roofing felt included. Position: full sunSoil: moderately fertile, well-drained soilRate of growth: initially slow to establishFlowering period: September and OctoberHardiness: fully hardyThis is a star plant for any garden. Its compact, and doesnt take up too much space, but its also dramatic. Narrow, silvery leaves&amp;nbsp; have a white stripe down the centre, and masses of upright, feathery, reddish-brown plumes fade to silver in the autumn. When the flowers catch the evening sun, the plant appears to be sitting under a silvery halo. Garden care: Cut back in late winter before the new foliage appears. 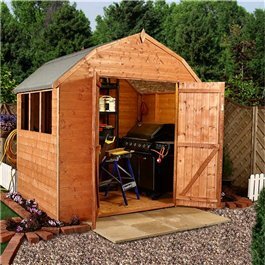 This superb barn style garden shed has been designed to provide a work space or a place to store all of your garden essentials. 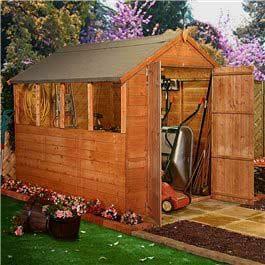 This garden shed needs easy assembly. The garden shed also provides a generous ridge height for the tallest of people and is constructed using robust framing for additional rigidity. The Iris Reticulata are ideal for a rockery and have beautifully shaped flowers in Blue shades.Flowering in March to April.Height of 7 to 15cm. Spread of 5 to 10cm.Plant in full sun to partial shade.Delivery will be October to end of November. Damsons – ready for picking? Are my damsons ready for picking? I don’t think so. They’re still quiet hard and sour. I think they need a couple more good days of sun. However a lot are falling off which are ripe, so these are so sweet and delicious if you collect them! I’ve just read the way to tell if they’re ripe is to shake the tree – so it’s obviously right – the ones on the floor are ripe. Just need picking up and washing before eating or jamming. I’ve made so much jam this year and am looking forward to making some damson jam too. Once I’ve had my pick of the tree there’s a queue of people wanting them for wine and jam also. I’ve been promised a bottle of the wine so that’ll be interesting. The minimalist lines and bitter-chocolate colour of this outdoor sofa makes it stylish yet relaxed. Seatpad is supplied. Weatherproof, it's crafted from wicker-effect polethylene fibres, specially engineered for outdoor use and hand-woven over an aluminium powder coated frame. Modern brushed stainless steel outdoor wall light with clear polycarbonate shade. IP44.